The levy announced yesterday is progressive, precisely the type of approach that social justice principles and practicality dictate. But it is a one off response and another example of why we need to fix Australia’s taxation system for the long term. Eureka Street’s founding publisher Michael Kelly is one of the Australian Jesuits who had long discussed a journal of intelligent comment on topical issues in church and society. The models included long-running Jesuit publications overseas including America in the USA, established in 1909, and the The Month in Britain (1864-2001). Last week's media coverage of Chinese President Hu Jintao's Washington visit focused on Senator Harry Reid's offhand remarks. Reid called Hu is a 'dictator', describing his government as 'different' to that of the US. But China is on a path towards a form of democracy that may be no less democratic than many western nations. A young man, made of ebony, from Senegal or Somalia or the Côte d'Ivoire, sat down beside me gracefully… I gave him the twenty euro that I had to hand. Stammering, ill at ease, he asked me what I had in mind. Australia Day is supposed to make us feel good about ourselves as a nation. This year, the scheduling of the four-part TV event Oprah's Ultimate Australian Adventure ensures there's every chance we will feel good about ourselves, but as individuals. Indigenous antipathy to Australia Day is deeply entrenched. Wattle as a symbol offers an alternative because it is native to this place, and it is not a memorial of our ties with Great Britain. The speeches of the Tea Party movement, for all their faults, are notable for their vivid symbolism and appeal to values. When was the last time you heard an Australian politician invent their own intelligible metaphor? BACK TO SCHOOL shout the billboards and shop window displays and it's still only mid January. I suppose this infuriates present day kids as much as it used to stir my juvenile ire. For former teachers, 'Back to School' arouses other, less youthful associations. Although Mary is an infuriating ninny, we get to know her well enough to appreciate that gasping for breath beneath her wine-swilling garrulousness are deeply felt insecurities and a desperate desire to be loved. It scratches a weird, deep itch when we're made to want to buy something in a way that feels intelligent and fresh. Coke manages to scratch that itch frequently. But the new Diet Coke ads feel lazy, cheap, sexist, and patronising. Do Australians hate Americans? No, because Americans invented basketball. What do Australians eat? Yeast paste. It tastes like someone ground up a penguin and then left it in the rain for a month before adding rubber and dirt to it. It all takes place because of some geological fault. I think God understands more things than he is given credit for. I am bloody tired of journalists comparing one woman against another, as if there were a competition to find the 'real' woman leader, a winner and losers. That isn't how women tend to use power: it can be shared, and used for the common good. We saw Bligh and Gillard doing it, and didn't get it. 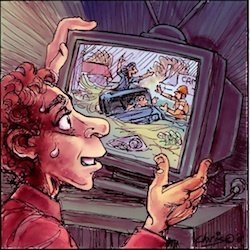 Durng the past week, we've been treated to wall to wall television coverage of the Brisbane and Queensland floods. Some would argue that television, and indeed the media in general, is all about fulfilling the human need for gratification, prurient or otherwise. According to predictions based on earlier floods the ground floor of my house was was going to be inundated, so all our worldies were brought upstairs. We waited. It rained. Then on Tuesday morning something interesting started to happen.